We’ve got the Ricks settin’ records, we’ve got every media person in Dallas telling us what the Cowboys WON’T DO, and also FOOTBALL IS BACK! 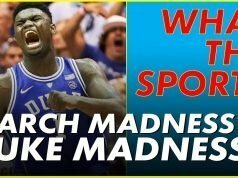 This is What The Sports?! w/TJ Carpenter. This is your Dallas What the Sports Flash in 90 seconds. The Dallas Mavericks held Portland to 9 points in the 4th quarter in their 102-101 win which is a franchise record. Doncic also had 28 points, 9 rebounds and 11 bugs swallowed which is also a record. The RICKS are now 26-29. 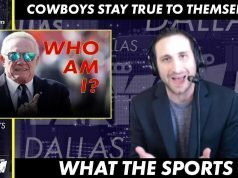 The Dallas Cowboys are not going to pursue adding a veteran QB like Nick Foles or Ryan Fitzpatrick according to people with no knowledge of the situation… but we’re still going to talk about it because we have nothing else better to do and Cowboys fans are too impatient to just wait and see what happens. Wise words from the Ole Ball Coach. I’m so glad Steve Spurrier came out of retirement, put on a shirt, and decided to once again bless us with his confucius-level wisdom. Next articleWould Tony Romo Make A Good Head Coach?